Laying the track on the 1950s layout. 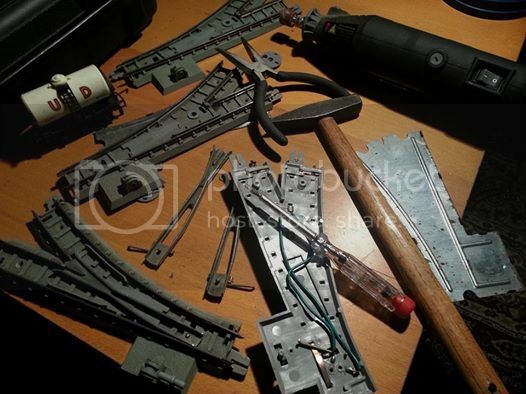 Working with the standard grey track is not without difficulties, the points are a nightmare and the major cause of derailments. I have reduced the number of points to a minimum and taken the best of what I had. problems one at a time, but I am going forward. principles of the real life railway, even if we are unable to put them into practice in a model form. Whats so bad about the points, Bill? Warping of the plastic used by the Rovex factory was a major problem. Coaches of the time came in two varieties, banana shaped ones and ones where just the roof curled up rather like the early BR sandwich. The grey plastic bases did the same. When the system three black sleepred track came out, many users screwed it to hardboard cut outs which brought it up to the same height as the grey track. Ah, thanks, I never used the stuff, or the Series 3 version either. They were just too crude even compared with Super 4 which wasn't brilliant either! I always felt it was a shame that when Triang Hornby developed "6" they decided to make the sleeper spacing compatible with Peco thus making it HO scale track and not OO. Reducing the rail height but keeping the sleeper spacing of Super 4 would have made a lot better looking track. Last time I looked at my old Triang system 2 track it had shrunk so much it was down to about 14mm gauge. Fine scale TT anyone? The standard radius at 13.5" was a bit too tight to be useful so I gave up. I did not see any evidence of warping though. The sleeper spacing of Peco and system 6 is more correct for H0. Seen without an 00 train standing on it, it looks ok, spacing the sleepers at 4mm/ft scale without widening the gauge does not improve the overall appearance. I think that if the rail/sleeper spacing bothers you, you should be considering EM or P4. I found that bringing the track level up towards eye level, makes the discrepency harder to spot. Blair your chosen scale and gauge might mean a lot of kit and scratch building, but you escape the dilema of 4mm/ft on 16.5mm gauge that we standard gaugers have to contend with. I still find the early Triang particularly the "Transcontinental Series" have a degree of charm if not accuracy. You are all closet narrow gaugers really!! I always understood that Peco track was HO scale as that's where the majority of their sales are. Every Model Railway shop I've been to in Europe has stocked it! I feel that the (nearer to) scale OO track such as C&L looks far better than the Peco stuff. I was always a fan of Farish Formoway as well, which seemed to have a slightly larger sleeper and spacing than Peco way back in the 60s and 70s! BTW the track I use is Peco Nn3 (also marketed as Z) so not very accurate so I've no reason to take anyone to task!! b308 wrote: Whats so bad about the points, Bill? There were several types of points used during the lifespan of Standard track, the ones that give the problems are the early ones with moving frogs. This may be due to the plastic warping enough to cause the bogies to ride up over the frogs, the later standard points were much better. using only what was available to hobbyists in 1979. Using this concept, I am building a second layout based on what was available in 1962 ( this allows the use of Standard, Series 3 and a little bit of Super 4 track as well). 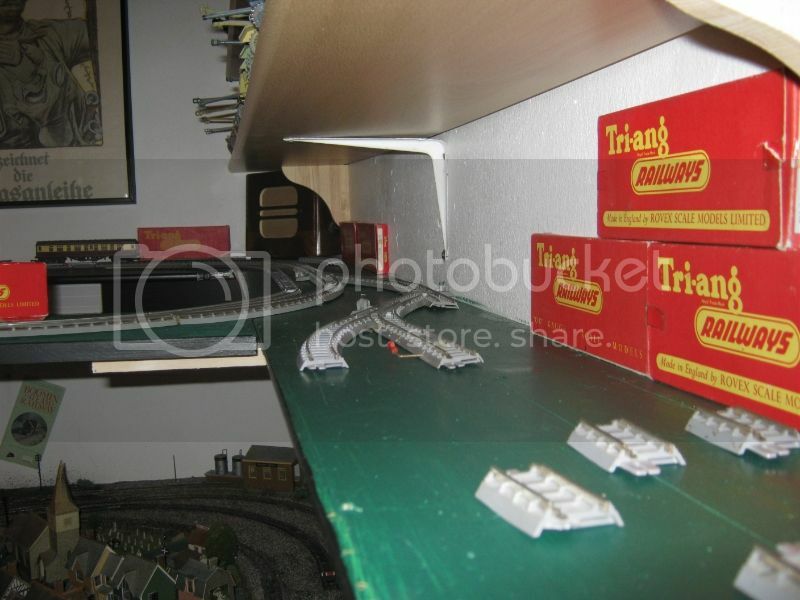 I see my two layouts as a mini Tri-ang Hornby living/working "museum", trying to display as many of the old products as possible in the space allowed. I have just obtained a marshall mkII controller (1959) for the Tri-ang layout and some 1940 electric cable. Bufferstop wrote: I still find the early Triang particularly the "Transcontinental Series" have a degree of charm if not accuracy. Same here especially the blue double ended diesel - i think its because i had a push along one when i was young and always wanted a powered one! The Triang Standard grey track in use......... all rolling stock is 1950s, track shown is Standard (1952) and series 3 (1958).